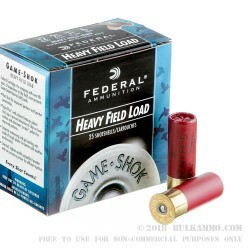 Federal’s heavy field load in #6 shot with a 1 1/4"ounce load of lead shot suitable for upland birds and small game. This is a 2 ¾” shell for use in any 12 gauge shotgun including semi-automatics, which should be able to easily digest the load without adjustment. This shell is purpose built for the birds with the extra patterning and the heavy lead shot in the large cup. But it is easily used on other game, including coyote at short ranges and on squirrel, rabbit and other small ground game out to about 35 yards. 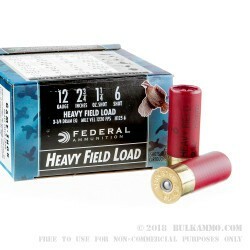 The quality and reliability of Federal field loads is uncompromising and they have a reputation for delivering exceptionally consistent cartridges thanks to their relentless factory quality control standards and their attention to the needs of the user. 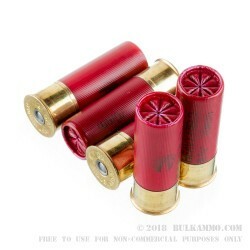 This shell is a fairly heavy recoiling round, but it puts you on target with some shot to spare, so you’re likely to get your birds or other game with fewer shots and without difficulty compared to other value priced ammunition. This load offers a 1220 feet per second velocity and a moderately high 3 1/4 dram equivalent (the amount of black powder it would have taken to equate to the same power delivery as the current powder load) so you will feel it when you shoot.